Born in Britain, Ven. 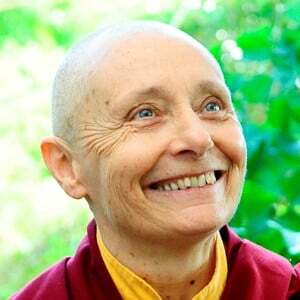 Tenzin Palmo met her teacher, the eighth Khamtrul Rinpoche, in India in 1964. She was one of the first Westerners ordained as a Tibetan Buddhist nun. After studying with her teacher for six years, she went to a small monastery in Lahaul, India, where she practiced more intensely. Seeking better conditions for meditation, she lived in a cave in the mountains in Lahaul for twelve years, after which, in 1988, she went to Italy. She has taught Dharma internationally and is the founder of Dongyu Gatsal Ling Nunnery in Tashi Jong, India, where she now lives. Her life is the subject of the book Cave in the Snow .